"All This and Rabbit Stew" features Bugs Bunny being hunted by a slow-witted Black hunter, very similar in speech pattern and mannerism to StepinFetchit. After Bugs outwits the hunter several times, Bugs wins all of his clothing through a dice game. Due to the film's stereotyping, it has not been seen on television since 1968, and is one of the "Censored Eleven" group of banned Looney Tunes shorts. After winning a dice game, Bugs wins the Black man's clothes and then runs off with them, leaving the man with nothing but a patch of leaves covering his crotch. Elmer Fudd, pictured with Bugs, was also originally black. 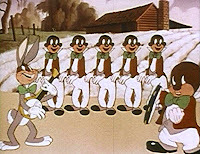 In a 1946 Looney Tunes short "The Big Snooze," the animation of the Black hunter was redrawn into animation of a white Elmer Fudd. Of course they did leave Daffy Duck and Marvin The Martian black.